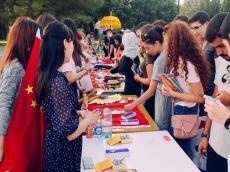 Young volunteers from all over the world gathered at Baku Boulevard to present traditions and customs of their countries within the Global Village festival. Every year, representatives of different cultures come together at the Global Village festival, turning the fest into one of the brightest and most dynamic youth events of the year, Day.Az reported. This year the Festival was held with the support of the Baku Seaside Boulevard Administration. During the festival, representatives of 20 countries demonstrated the beauty and diversity of their cultures. By the way, the Embassies of Egypt and Indonesia made their invaluable contribution to the successful holding of the festival. Visitors to the Festival got acquainted with the culture and traditions of different countries, including Russia, Turkey, Sweden, Kazakhstan, Morocco, Kyrgyzstan, Afghanistan, Egypt, China, Ukraine, Canada, Poland, Germany, Italy, Georgia and others. Foreign guests also enjoyed Azerbaijan's cultural heritage, including mugham and national dances. Representatives of the above mentioned countries are participants of the social projects "Build Your Future", "Fireflies", "Step Forward", "Goygol Academy", "Women empowering Program", "Dare2Share", organized by AIESEC in Azerbaijan in the summer of 2017. All projects of the youth organization AIESEC in Azerbaijan are based on the goals of sustainable development of the UN, the achievement of which is planned before the end of 2030. The projects are aimed at solving social issues of youth and society. Among the organizations supporting the activity of AIESEC in Azerbaijan are the Youth and Sports Ministry, as well as the Ministry of Tourism and Culture.